I try hard to fly twice a week. Otherwise I wonder how sharp my skills are and flying isn’t something you want to do when you are rusty. Even a little. Mistakes, especially when they start to chain together, take the situation out of your control very quickly. Last Spring I had two incidents that made it seem like I should be flying more, but they were really just random. The first was on a flight from Santa Monica down to Long Beach. I was picking up my niece Emma from JetBlue’s terminal and flying her back up for a visit. A standard part of my pre-flight inspection is to peer into the air intake vents at the front of the cowling. My flight instructor always said, “You’re just looking in there to make sure a bird hasn’t built a next since you last went flying, and to make sure something didn’t blow off the ramp and get stuck in there.” I always thought it was an odd exercise, since our training plane was usually still warm from the last student. Even in my own plane, I had often been up in it just a day or two before. Imagine my surprise that morning when I looked in and there was a bird’s nest. I heard angry cheeping and turned around to see a sparrow up on the edge of nearby hangar. It had only been a day since my last flight, so the nest couldn’t be finished. I reached in and started tugging out pieces of it. 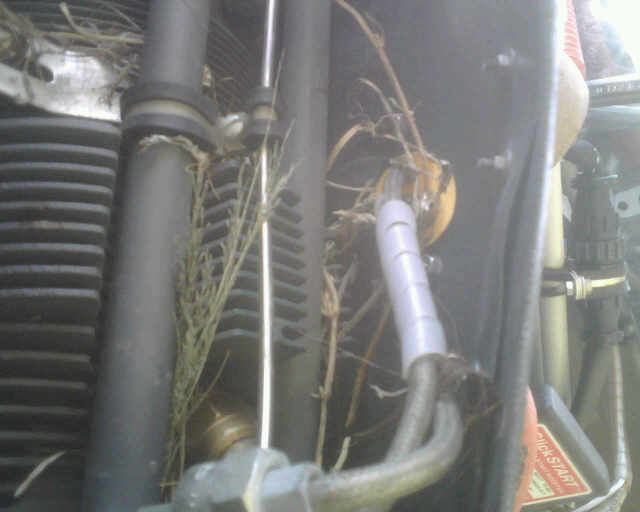 It was a few handfuls of little branches and dried grass, but was clearly just some portion of a nest, not the completed item. As an architect I felt that it could use a little more structural integration and integrity. I’m sure the sparrow was pondering, “What will this nest say about me as a bird and as an artist?” After I cleared out all of the brush I could see, I completed the rest of my inspection and took off for the short flight down to Long Beach. The second incident was only a week later, which really made it seem like a hint about getting the plane in the air more often. Otherwise, how would it be such an attractive target? I got a call from my friend Art, whose airplane is parked next to mine. He said, “Are you going flying today? Before you answer, let me tell you: no, you aren’t.” He said there were bees on my plane. I decided that warranted an in-person inspection. I hustled down to the airport expecting my plane to look a little like a flowering bush: besieged by a crowd of honeybees for some reason. Oh, I was so wrong. In the spring the queen leaves the hive and migrates to a new location where the population of workers build her a new hive. Of course, she gets tired, and has to stop to rest. Where ever she does that, the hive-building starts. But she’ll lift off again and they leave behind just a waxy foundation of hive planning. The night before a queen had stopped for a rest on my cover. I arrived to see over a thousand bees piled on top of her. The airport security car was there. 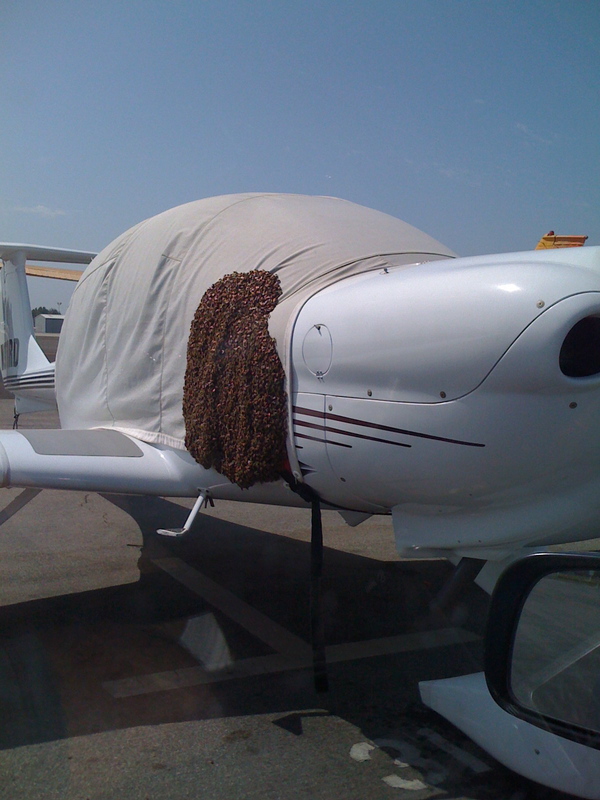 They told me they had called Santa Monica Animal Control, who would come remove the bees, making it safe to take the cover off the plane. I was a little curious what they would do (hose? trap? bee suit? ), but after half an hour of staring at the vibrating, crawling mass of bees I had to head home. I discussed with Art the daring act of removing the cover from the plane from the port side, then dashing back to the car to see what the result would be. He said he would be happy to watch me do it. I didn’t need to go anywhere, so I couldn’t get the motivation up to risk getting stung. When I returned in the afternoon for my Angel Flight, the cover was missing from the plane. There were still a dozen or so bees on the canopy, milling about on the spot which would have been just under the spot on the cover where the queen had been. I snuck into the plane from the passenger door in the back, started the engine and blew most of them off. The rest departed while I did my run up, so I was able to load my Angel Flight passenger without incident in the transient parking area. The airport security people had my cover. They said the bees left on their own before the Animal Control People had gotten there. They suggested I bring the cover home for a scrub, which I did. As I drove home I thought about the flying beasts which had made the plane home for a little while. If I were a sparrow I would have enjoyed growing up between cylinders one and three in a parked plane.